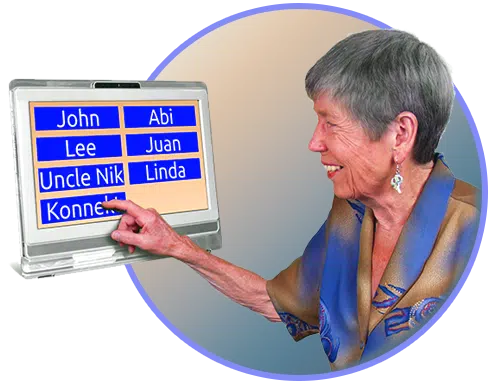 The Konnekt Videophone is an incredibly simple Parkinson’s / arthritis phone ideal for those with arthritis, Parkinson’s, MND, ALS, CIDP, CP, MS, carpal tunnel syndrome, or difficulty using their hands. Videophone has no handset to lift or hold. There are no physical buttons to push. It has no keyboard, no mouse and no remote control. The advanced 15-inch touchscreen features HUGE light-press Call Buttons, personalized with your friends’ names, and is incredibly easy to operate – even with a shaky or unsteady hand. Just ONE TOUCH to call or answer. Our Videophone lets you SEE and talk to your family & friends, with ease, from anywhere in the room. Bring a smile to their day, check that they’re well, show them you’re OK, and have a face-to-face conversation – without the need for travel! Konnekt does everything: Setup, personalization, testing, delivery, support… we even help your Contacts get going and optimize their video. Call or email us for help or to make changes remotely. We personalize buttons and messages, in any language, and customize ringing durations so you can take as long as you want to answer… with just one touch. Calls from trusted carers can be auto-answered, in case you have trouble answering. Unlike an intrusive webcam, you can read and see exactly who’s calling and there’s full two-way video and audio. It can be hard to get out and meet your friends and family, and even harder when they don’t live nearby. With our arthritis phone, there’s no need to feel lonely: You can share a smile and have true face-to-face connection with your local and overseas loved ones – as often as you want, as long as you like, at any time. Large 38 cm screen. No handset to hold. Use from your favourite chair. Huge one-touch Call buttons. Great for unsteady hands. Advanced touch-screen needs just a light press using any object. Friends can show photos from their PC/Mac to your Videophone while you talk. You do NOTHING! Just sit back and enjoy. A single touch tries calling face-to-face, then home / office backup numbers in turn. Auto-answer option for trusted carers. Answers with zero effort.